Golfing is a very popular sport in New England. There are literally thousands of golf courses throughout the region and some of the best are the public courses along the seacoast. Golf was born in the rugged terrain of Scotland, and the similarity to the terrain of the New England coast has often been noted. Golf courses are rated on course layouts and course conditions. Though there are some spectacular private golf courses, the public courses frequently show up on lists of the best area courses. Well maintained and challenging they attract many vacationers who spend their time playing different courses. The public courses are real bargains too when compared to what it costs to play at private clubs. 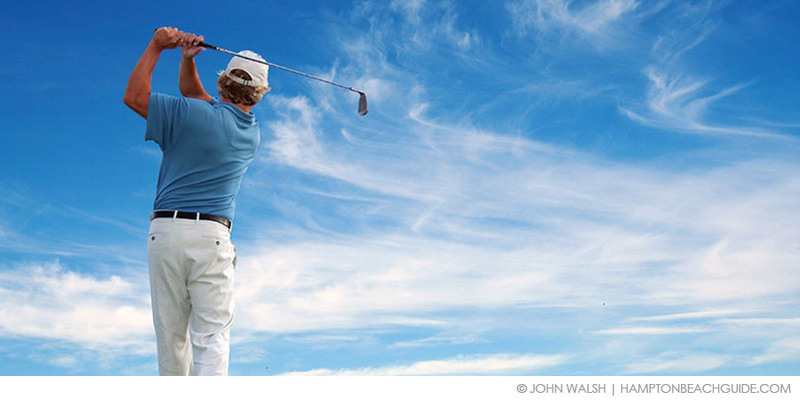 There are public golf courses in virtually every area of seacoast New Hampshire, Maine and Massachusetts. You could play your way down or up the coast and find yourself in golf paradise. For example, the Ledges Golf Club in York, Maine has everything a golfer could want. This public course is scenic and offers spectacular views and even wildlife sightings. It’s called picture perfect and rivals most private courses in terms of design and grooming. The rugged terrain creates challenging conditions for play and includes pine tree lined fairways and tough greens. The highly rated golf course is worth planning a golf vacation around. If you want to play a golf course with some history, then try the Sagamore Hampton, NH. The course has been in operation for over 45 years and is designed to please seacoast golfers. In Maine you can find what has been called the friendliest public course. It’s also open for winter golfing because bay breezes keep the air temperature moderate. Located in Onset Beach, MA, this course is maintained like a private course but charges reasonably priced fees. These are just a few of the public courses you’ll find along the New England seacoast. There are dozens more including Pease Golf Course in Portsmouth, NH and Dune Grass Country Club at Old Orchard Beach, ME. When you’re planning a golf vacation, the New England golf courses will not disappoint. You can find a complete of public courses just by doing a simple internet search. There are great accommodations near all the courses too. Non-golfing family members can head for the local beaches or attractions while golfers head for the course.